Can Senator Jeff Merkley Help Democrats Reclaim the Health-Care Narrative? The soft-spoken Oregonian is a relentless legislator and a staunch progressive—and his rise comes at a crucial time. In the fall of 2009, as he was preparing for a town-hall meeting in rural Oregon, Senator Jeff Merkley’s staff got a call from a local lawyer, who advised him to show up wearing a bulletproof vest. Merkley, along with Barack Obama, had been elected the previous year, narrowly unseating a Republican incumbent. His first months in office coincided with the rise of the Tea Party in the remote, conservative territory that comprises much of Oregon. In Prineville, where the town hall was scheduled to take place, gun-rights activists were preparing to greet him with a demonstration. Merkley, 60, was born in the heart of Oregon’s timber country and still lives in the working-class Portland neighborhood where he grew up. Every year, he holds a town hall in each of Oregon’s counties, the bulk of them on Republican turf. He’s done more than a dozen already this year. “The reception has been unrecognizable,” Merkley said recently, while nursing a beer at a Capitol Hill bar decorated with mounted boar heads. The people packing his town halls are still anxious about health care, but now they’re clapping for him. Few areas in the country have been helped as much by Obamacare as central and eastern Oregon. Merkley likes to ask people to visualize the roughly 400,000 Oregonians who have been added to Medicaid under the ACA: If they stood in a line holding hands, it would stretch from the Pacific Ocean to Idaho. Soft-spoken, analytical, and earnest, Merkley has spent much of his time in the Senate backstage, working quietly to advance a full slate of progressive issues—from Wall Street, housing, and health-care reform to LGBTQ rights, climate change, and ending the war in Afghanistan. He is known as a tenacious legislator: “When Jeff Merkley gets behind something, it passes,” Senate minority leader Charles Schumer said recently. Still, Merkley comes across more like a professor than a politician. During one interview, he offered a detailed geological history of a basalt-walled canyon in the Columbia River Gorge, explaining how it had been scoured out by floods at the end of the last ice age. Recently, Merkley has become a much more visible force in the Democratic caucus. He was the sole senator to endorse Bernie Sanders during the presidential primary and, after Hillary Clinton secured the nomination, was mentioned as a possible vice-presidential pick. After the election, he was elevated to chief deputy whip, becoming the first Oregon senator since 1944 to assume a leadership role. Since then, Merkley has embraced the movement calling for all-out resistance to President Trump’s agenda. In April, he committed what The New York Times called a “feat of congressional masochism,” speaking overnight for more than 15 hours against the confirmation of Neil Gorsuch to the Supreme Court. Merkley’s rise comes at a crucial time for Democrats. In the Senate, one of their most urgent tasks is resisting Trumpcare. “The path is clear for Senate Republicans to do something very unhelpful to the quality of life of working Americans, and we’re very worried about it,” Merkley said a few days after the House vote. Whether or not a GOP overhaul of Obamacare makes it into law, a more complicated task for Democrats in the next two years will be articulating an alternative. It’s the kind of project that has excited Merkley since he was the minority leader of the Oregon House, which he helped flip to the Democrats in 2006, after a 16-year slump. Last fall, after Aetna announced that it would pull out of most Obamacare insurance exchanges run by individual states, Merkley re- ignited the conversation about a public option. He thinks Democrats should keep talking about that, about fixing the real holes in Obamacare and lowering the Medicare eligibility age—a sort of bridge to a single-payer system. “We should be laying out that vision and not just trying to send off the bad stuff,” he told me. On the wall in Merkley’s Washington office hang three pictures representing the pillars of Oregon industry: the cultivated fields of the Willamette Valley; Celilo Falls, a Native American fishing area that was destroyed by a dam in 1957; and a stack of massive boards milled from Oregon logs. Merkley was born in Myrtle Creek, a small timber boomtown. His father worked as a mechanic in that industry, and on his modest income the family was able to afford a car, occasional vacations, and a house in a blue-collar neighborhood in east Portland, where the family moved when Merkley was in elementary school—and where he and his wife, Mary, a nurse, still live. The first in his family to attend college, Merkley watched as the financial stability that his family had attained slipped away from his younger neighbors, many of them immigrants. “The only way they’ll be able to buy a home…is if they inherit it from their parents, because the jobs just pay a lot less relative to the cost of living,” Merkley said. He credits his background for his attention to a number of pocketbook issues, from college debt to predatory lending. “Many elected leaders come from privileged backgrounds, live in privileged communities, associate with wealthy people, and they just don’t see it,” he said. Merkley’s own route to public office was, by his own description, “peripatetic.” He’s worked as a carpenter and a nuclear-weapons analyst, and he lived for a time in Ghana, Mexico, and India. At 19, he interned for moderate Oregon Republican Mark Hatfield in a Senate that was “entirely different” from the partisan, log-jammed institution he entered in 2009. Merkley won his first campaign, for an open seat in the Oregon House in his home district, in 1998, and was elected minority leader in 2003. Dave Hunt, one of Merkley’s colleagues at the time, remembers their first leadership meeting of the session as a depressing affair: They had no money in the bank, and three caucus members in the most vulnerable districts had decided not to run for reelection. Undeterred, Merkley demonstrated a knack for fund-raising and candidate recruitment, and he developed an agenda to present to voters that Hunt described as a progressive version of Newt Gingrich’s Contract With America. When the Oregon House flipped blue in 2006, Merkley was unanimously elected speaker. After winning his Senate seat, however, Merkley was taken aback by the rank partisanship in Washington. In a floor speech a few months into his first term, Merkley thrashed then–minority leader Mitch McConnell for parroting the talking points of Republican strategist Frank Luntz, who had laid out a road map for squashing health-care reform. What really bothered Merkley was that the GOP had decided on all-out war before the bill was even written—legislation that was ultimately modeled on a conservative plan, Merkley reminded me. Frustrated that the chamber had gone “from being a cooling saucer to being a deep freeze,” Merkley made rules reform one of his main priorities, a plan that paid off in 2013, when then–majority leader Harry Reid ended the filibuster for executive-branch nominations and non–Supreme Court judges. Merkley’s three-inch perspective earned him other victories as well—most notably the Volcker Rule, aimed at limiting risky trading by banks, which was passed as part of the Dodd-Frank financial-reform legislation. He had a gleeful gleam in his eye as he told me, in fine-grained detail, about an obscure parliamentary maneuver that he used to move the rule forward in the Senate. “This gets a little arcane,” he warned, before plowing ahead with the story. Attuned to issues others might consider small-bore, Merkley has championed legislation to make life a bit easier for his rural constituents—helping farmers more easily transport their harvest across state lines, for instance, and rescuing small-town post offices slated for closure. 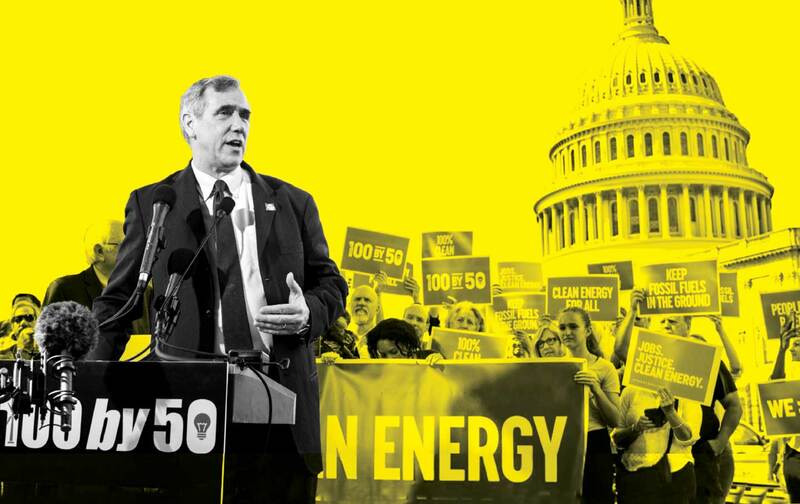 One morning in late April, Merkley walked to the lawn in front of the Capitol to talk about a more sweeping piece of legislation: the first bill in history to propose a full transition from fossil fuels to renewable energy. Merkley has been contemplating the prospect of planetary annihilation since his work on nuclear weapons in the 1980s, and he traces a direct line from that to his interest in climate change. His arrival at the press conference attracted less attention than that of Bernie Sanders, who approached the small crowd to delighted cries of “Bernie!” looking, as usual, as if he’d just received a mild electric shock. But it was Merkley—several inches taller than Sanders, and wearing a dark blue suit and Oregon lapel pin—who ran the show. “You’re a rock star, senator!” an audience member shouted as he went to the microphone. In contrast to the righteous crankiness of Sanders, Merkley’s oratorical style is steady and contained. He spoke about forest fires and dwindling snowpack, oysters dying off in acidifying oceans, the rapid march of tree-killing beetles. “This is the biggest test facing human civilization, and we have to respond,” he told the audience. Then, true to form, he brought his focus from 30,000 feet to three inches, urging supporters to press their local leaders to adopt clean-energy action plans. “Anything worth doing takes people working inside…and it takes grassroots action,” he said. Listen to Zoë Carpenter discuss Merkley’s plans on the Start Making Sense podcast.